Meher Baba (25 February 1894 – 31 January 1969) was an Indian mystic and spiritual master. He declared himself to be the Avatar of the era. Brunton later wrote he was not impressed with Meher Baba. In 1931, Meher Baba visited the West and America and he attracted many followers. 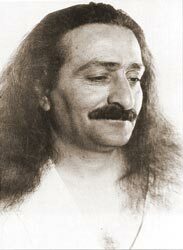 Meher Baba was later injured in two car accidents in the US and India. They confined him mostly to a wheelchair. He continued to practise spiritual disciplines of fasting and seclusion until his death on 31 January 1969. His shrine is in Meherabad, India. Discourses by Meher Baba, pp. 266-270.